Urban Decay isn't one of the big advertisers of the beauty world so they may not be the first brand to spring to mind when considering your next make-up purchase. However, they are one of my favourite brands and I'm yet to try a product of theirs which I don't adore. Don't be fooled by their fun packaging- the products are high quality and an absolute joy to use. 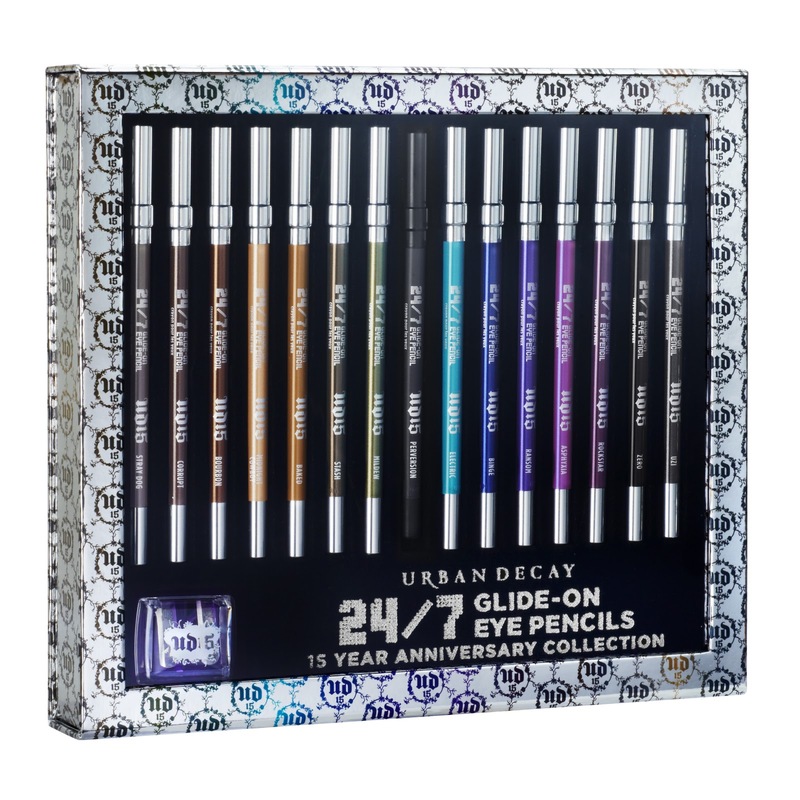 To celebrate 15 years in the business, Urban Decay have launched the 15 Year Anniversary Collection of 24/7 Glide-on Eye Pencils and I was lucky enough to be sent a set to try. The set contains 15 Glide-on Eye Pencils, 9 of which are existing shades with 6 new launches. I've tried each of them and written my own interpretation below. I'm not normally a swatcher so I'm intrigued to see how you'll respond to this post- do let me know if it's something you'd like to see more of on Skin Deep but please don't judge the photography! This photo was taken indoors without flash. Yet again, Urban Decay have surpassed my expectations. Although some of the shades aren't as pigmented as I'd like, most of the shades are bold and the pencils are very soft with no pull upon application. The waterproof formula is super long wearing, to the extent that I actually struggled to remove the colour using my usual eye make-up remover. I really like the detail in this set- the presentation is fantastic, there's a good range of colours from the everyday wearable to more daring & I like that it contains a double sharpener. I have to admit to being a little shocked upon hearing the price- it's £60 which seems a lot for a make-up kit but when you consider the price of the pencils individually (£180 for the entire set), it actually works out at good value and would definitely be a good investment for an eye make-up fan. 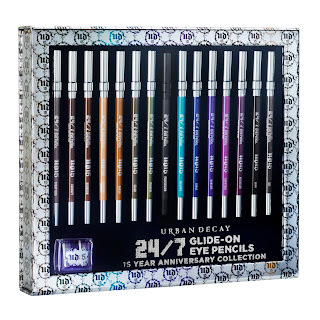 Urban Decay will be launching a collectable anniversary edition every season of 2011... I literally cannot wait to see what the next set will comprise!